We have changed the format to Breakdown this year. 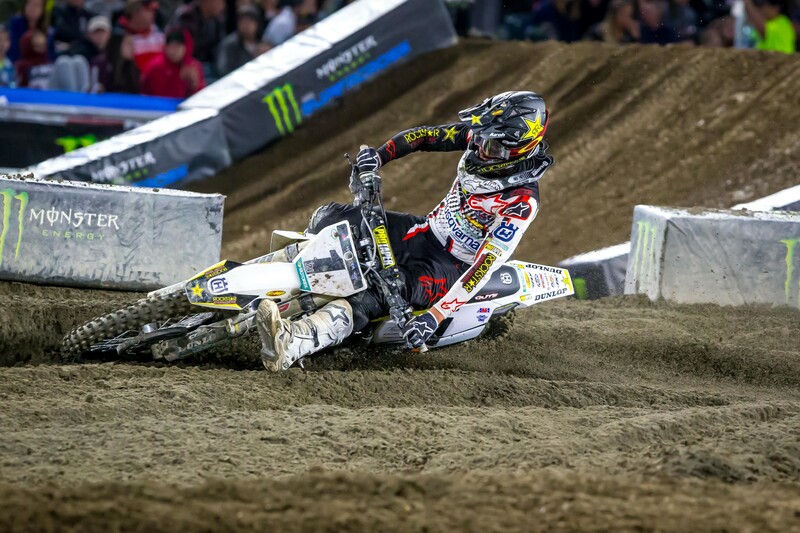 The Racer X staff will pose some burning questions from the weekend and I'll take my best crack at them. All of these opinions are my own and usually in stark contrast to anything Steve Matthes would believe. Cooper Webb, how do you explain this? I think it’s a combination of a few things. First, it’s impossible to overlook the multiple changes he made this off-season. By multiple, I mean pretty much everything. He switched to the Red Bull KTM team, which is the most obvious. Many thought the smaller KTM might help the smaller-in-stature Webb. That looks to be playing a role already as he looks more aggressive and his starts have improved. Both the Yamaha and KTM are capable of winning but certain bikes work better for certain riders. Another change was to his training program and location. He moved down to Clermont, Florida, and into the Baker’s Factory. That aligned him with other superstars like Jason Anderson, Marvin Musquin, and Zach Osborne. Whether it was changing the program, riding with a higher caliber of riders, or just a change of scenery, it seems to be working. Time will tell (and maybe he will weigh in, too) on exactly what we can attribute this turnaround to, but one thing’s for sure, this is a different Cooper Webb than 2017 and 2018. Jason Anderson, how do you explain this? I can’t! I still believe he had some sort of setback that he is dealing with, whether it was a crash or injury, etc. I was shut down on this as being wrong and that could very well be the case, BUT, how else do you explain what we have seen? He has had two of his worst main events (out of three possible) in years without any plausible explanation. In his one good race, he was unable to sustain the pace in the same manner he was able to in 2018. That’s typically a dead giveaway that there was an interruption in the off-season. Listen, I am not saying I know what happened but every time I hear “he’s fine, nothing is wrong, you guys are crazy,” I believe it less and less. This Jason Anderson is not the same Jason Anderson we watched last season. Something is up. I LOVE THE TRIPLE CROWNS. Having six meaningful races is something I will sign up for every week. I know that it’s a tough ask for the teams and riders but for everyone else, it’s awesome. I heard several mechanics mention that it’s really taxing on the entire team to make it work. Still, I think that can be massaged and helped. Preparing more and earlier will help with the rush job. Needing two bikes is a tough hurdle to get around as most riders simply can’t pull that off but if we can find a solution, I am in! Better product equals more fans. Will this format change how the riders train? Most of the field was completely gassed at the end of the third main event. I do think they will have to account for these events, especially if the format expands to more rounds. Being able to recover quickly and get back to peak performance over and over is a very specific fitness goal. I don’t think they will need to reinvent the wheel but tweaks in the preparation will certainly help. If you were fresh and could push hard in the waning laps, there were points to be gained. Several of the riders looked to have lost their ability to fight back and a pass that was unlikely on lap three was a certainty on lap 12. That’s worth changing the program for. The biggest variable was the mid-week rain. That softened the dirt and added ruts, bumps, and soft spots that aren’t normally an Anaheim problem. Many of the big mistakes we saw were due to cross-rutting or an unexpected bounce from spongy dirt. The design had some big rhythm options, namely the two straightaways before the finish line section. Riders were jumping from the face of one tabletop to the top of another, while clearing a single in between. It was tough to time just right and presented a harsh landing each lap. The next rhythm featured an on-off tabletop section, a quad, and a triple into the corner. Many riders gave up that option late in the final main as it was too tricky to maintain. More than anything, though, the rain increased the level of difficulty. If those jumps were rock hard and typical Anaheim, we would not have seen near as many mistakes. Speaking of rain, California has been lashed by it lately. What problems does the rain cause in relation to practice, testing, and travel? Above all else, it’s an inconvenience. Following social media, we learned that Eli Tomac stayed in Arizona all week to practice, as did Dean Wilson. Cole Seely, Ken Roczen, and others headed to the hills to ride natural tracks and sandy terrain. Some that were planning on staying in California flew home to their local track to get practice in because California would be a total washout. Bottom line, most were able to get the work in that they needed, but it was just a lot more work and headache to accomplish. The caveat to that would be any scheduled test sessions probably got postponed. So, if you were a rider that desperately needed to improve his bike leaving Glendale, the weather certainly didn’t help sort out the issues.